from 80 pcs. 0,71 EUR ea. from 160 pcs. 0,66 EUR ea. 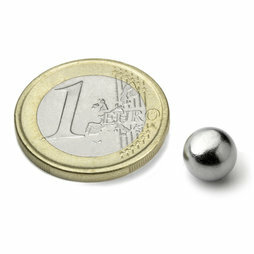 This 8 mm magnetic sphere is chrome-plated and wonderfully suitable for experiments and combining with other magnets. No one who comes into contact with these magnets ever wants to give them back. These small but very powerful super magnets inevitably arouse a sense of play. The more, the better. 5 pcs. 4,08 EUR ea. 20 pcs. 0,52 EUR ea. This sphere magnet works especially well on magnetic paint.